Despite the fact that we’ve all long been removed from the true sources of our food in the past few decades, most of us are aware of the use of animal manure on farms. An estimated average of four million tons of treated sewage sludge, cleverly reworded through the use of the PR industry term “biosolids” after it’s been treated, is used on farms across the country, and the EPA seems perfectly okay with it despite consistent scientific research showing evidence of harm. 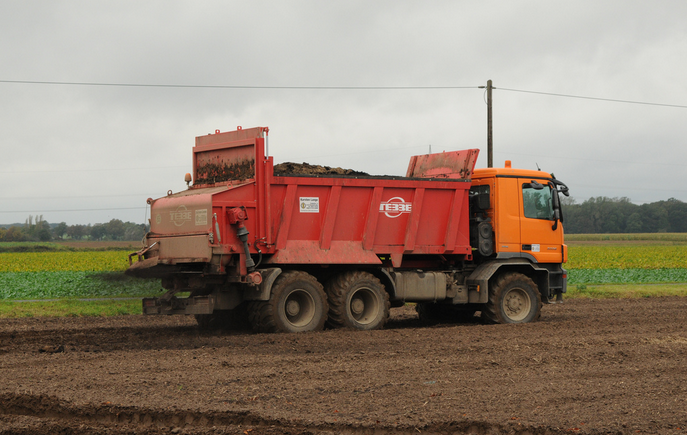 A vehicle spreads treated sewage sludge, aka “biosolids,” on a field for growing crops. Biosolids are the result of a wastewater treatment process, and local governments are allowed to decide whether to recycle it as fertilizer, incinerate it, or bury it in a landfill. Even as the EPA continues to allow the use of treated sewage sludge, aka biosolids, the agency’s own research has shown evidence of potential harm. In 2009, the EPA found dozens of hazardous materials, unregulated and not required to be tested for, in every single sample of sludge taken from locations across the United States. Pharmaceutical drugs residues are common, along with 27 different heavy metals. The potentially harmful antimicrobial triclocarban (found in soaps and the subject of FDA warnings) was also found along with three steroids found in all samples, and all but one included a flame retardent chemical. Several advocacy groups have called for an end to the use of sewage sludge including Farm Aid, the Natural Resources Defense Council, Center for Food Safety, Institute for Agriculture and Trade Policy, Organic Consumers Association, Center for Health, Environment and Justice, and dozens of other groups. Many recent studies have also demonstrated evidence of harm from the treated sewage sludge. Dr. David Lewis, an award-winning EPA microbiologist, also released peer-reviewed research showing illnesses and deaths linked to exposure to the controversial sludge that helped put a stop to EPA promotion of the highly controversial practice, although it is still allowed. Caroline Snyder, professor emeritus Rochester Institute of Technology and chair of Citizens for Sludge-Free Land, North Sandwich, N.H., also has noted that the use of sewage sludge often transfers man-made toxic chemicals from industrial sites, hospitals, business and households into the environment. She added that farmers and citizens concerned about the harmful effects and true nature of the “biosolids” can visit www.sludgefacts.org for more info. As of fall 2013, EPA regulations in America were considered to be among the most lenient in the world; wastewater treatment plants are only required to check for just 9 out of 80,000 potential pollutants that can make their way into the sewage sludge “biosolids” after processing. The EPA doesn’t promote the use of sludge anymore, but that hasn’t been stopping farmers from taking on the risk considering they’re still allowed to do so, and could stand to gain financially from it. Currently, the EPA says that about 50% of all biosolids are being recycled and added to land, amounting to less than 1% percent of the nation’s agricultural land total. And yet the sheer amount of sludge used on farms is quite high: an estimated 4 million tons of it, often applied as a free fertilizer to farms who may be incentivized to use it by local sewage authorities, and who accept because of the money they can save on it compared with chemical fertilizers. In total, an estimated 21 million to just under 55 millions tons of fertilizer overall were used on U.S. farms according to The Fertilizer Institute, compared with the 4 million ton sewage sludge total (in 2013). Backing the treated sewage sludge industry are PR agencies armed with sky-high budgets, including the Water Environment Federation which invented the term “biosolids” to obfuscate the truly unnatural composition of such highly contaminated materials. While most people are still unaware of this potentially dangerous practice, there are ways to avoid it, and more and more grassroots natural and organic organizations are taking notice. Whole Foods agreed to stop selling produce grown in the treated sewage sludge earlier this year, but only after several thousand emails were sent asking for the change. Of course, the best way to avoid the corporate finanical boon, and major health risk to consumers, known as “biosolids” aka “treated sewage sludge,” is to buy organic food. As noted in this article showing what the USDA organic symbol really means, the use of sewage sludge in products bearing the USDA organic logo is prohibited. And considering that most of us would never consider spreading the sludge in our own home gardens, it’s well worth noting how we can avoid it in the food that’s produced for us by others. Thanks for reading! P.S. You can subscribe for more articles and updates by clicking on this link. Tags: biosolids us farms, epa sewage sludge, human waste fertilizer, sewage fertilizer, sewage for fertilizer, sewage on farms, sewage sludge, sewage sludge fertilizers, sewage sludge on farms, sewage sludge organic, and us sewage.